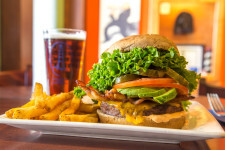 The Anacapa Brewing Company is Ventura County’s finest restaurant and only restaurant and brewery, or “Brewpub.” Stop by and enjoy a delicious meal and a pint of fresh ale in our 130-year old brick building or sit on our patio right off the sidewalk and take in the scene of historic downtown Ventura. We serve fresh, hand-crafted ales produced by our Head Brewer Jason Coudray in our 12-tank brewery using only the choicest malted barley, hops, and other secret ingredients. Our Executive Chef has created a mouthwatering menu of All-American grill items, pastas, garden fresh salads, gourmet pizzas, unique appetizers, sandwiches and burgers, fresh seafood and entrees including Filet Medallions, Pretzel Fried Chicken and the juiciest Half Pound Angus Burgers in the county, BBQ Pulled Pork Sandwich, Asiago Cheese Dip, Szechuan Shrimp Skewers, and the best Fish and Chips in the County along with homemade desserts. With a large variety of fresh, cutting-edge menu items, there’s something for everyone. All of our food is prepared from scratch from our own unique recipes.